It seems almost pointless to introduce the three sonatas for piano that constitute this recording - they are amongst the best known and well loved music ever written. Indeed, it was only by chance that we even decided to listen to the LP from which this restoration was made. I was making a rare visit to Peter Harrison's studio at disk2disc (our communications are normally via telephone and e-mail) and we were taking the opportunity to run through a batch of LPs together supplied for remastering by Don Petter. Peter got as far as the Beethoven and said something along the lines of "the last thing the world needs is another set of this lot!" - to which I replied, "well let's at least give it a listen!" So he slipped it out of the sleeve, gave it a quick dusting off, placed it onto the turntable and lowered the stylus. I only wish I could have recorded the sound of Peter's jaw dropping when the playing began! 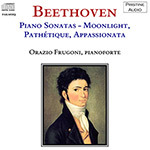 "Among the miscellaneous sonata records listed below we would direct attention particularly to the Vox disc of the three popular 'named' sonatas - the 'Pathétique', the 'Moonlight' and the 'Appassionata', by the young Swiss-American pianist Orazio Frugoni. His direct, sure and delicate playing gives his performances a vitality that more celebrated executants often fail to achieve in these works. We get, besides, a good deal of music for our money, and the recording is flawless." Orazio Frugoni occupied only a few decaying cells in my memory as a long-time professor of piano at the Eastman School of Music. I dimly remembered that these sonatas had been released on VOX in the USA in the early 50's on an LP weighing about three pounds, but remembered nothing about the performance. Like Peter Harrison, I was tempted to give it a miss. After the first movement of the "Moonlight", I was hooked. Here was another case, like Kathleen Long, of an outstanding pedagogue who was also a great artist, but did not pursue a concert career. Frugoni's artistic temperament, at least in Beethoven, is very classical, moderate, free of idiocyncracy, but none-the-less exciting. A bit like Wilhelm Kempff, if you will. In the "Moonlight", the first movement casts its spell over me anew. Th second movement sounds like more than an interlude and the finale is enormously exciting, highly articulated without banging. Wow, I love the "Moonlight" all over again. The piano sound here and in the other two sonatas is clear, pearly and powerful. The "Pathetique" first movement is exciting, but the "crack of doom/cheap thrills" way of playing the opening chords and the allegro has no place here. This is not Liszt. This was a ground-breaking work. Moscheles remembered when he was 8 years old and living with his teacher that he was forbidden to practice this work. So he would take a small candle and try to memorize the score in bed. Perhaps the teacher might have approved of Frugoni's performance. I always dread that moment, when after the exposition has been repeated and the development played when the recapititulation comes and Beethoven seems suddenly at a loss for what to do and just goes on and repeats the broken chords of the allegro that we have heard so many times. Well, Frugoni almost gets me through it. The second movement is almost too austere, but at least it doesn't remind me of the theme music introduction to Karl Haas "Adventures in Good Music", a program which may have contributed to the decline of classical music in the United States. The finale, usually a bit of an anti-climax, ends up being the most exciting movement of all, taken a a rip-roaring pace. The "Appasionata" is very well played, but perhaps a little too controlled. The first movement is very clean and free of rhetorical banging. The final presto of the movement is very exciting but not a scramble. The second movement variations, not one of Beethoven's most inspired sets, held my interest throughout due to Frugoni's beautiful tone and the pellucid restoration of the sound. The finale is very well articulated--not a note out of place. Frugoni hardly breaks a sweat--and that is a problem in the finale. One does need just a little bit of broken glass here, doesn't one? Overall, a forgotten, but near great, Italian-Swiss-American pedagogue and artist brought wonderfully back to life with something to say worth hearing in three overfamiliar Beethoven works.